In the goal cloud above, (roughly) 21 of 213 goals contain the words more or less or some other similar modifier. In other words, they’re vague. How much is more? How much is less? And my favorite, how much is -er? I assume each individual has some criteria in mind that becomes their marker for success, but modifiers such as more, less, and -er require nothing more than incremental change. I’m a relatively thin gal with awesome DNA and an awesome metabolism to thank for my figure? Say I wanted to gain weight so that I am *gasp* heavier? I might gain 3 lbs in a day of mere water weight if I simply chose hydration over coffee, but I’m not producing any real significant lasting affect on my overall health. Then there is the issue of time. By when does one want or need to be -er? A month? A year? 10 years? How about just sometime before death? 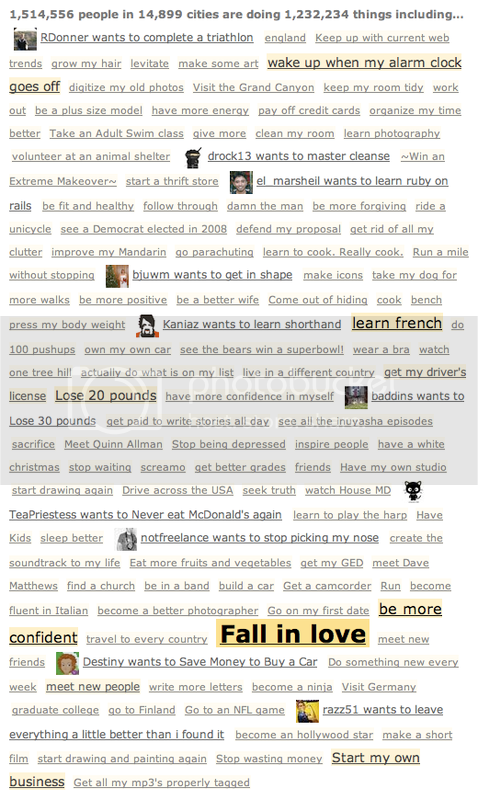 Take the goal of stop waiting (2nd tag from left, one row above the black cat avatar). Clearly a goal set by a procrastinator. Maybe they’ll start to stop waiting tomorrow. 21 of 213 is only 10%. Not bad. But vague modifiers and truant timetables aren’t the only problem. One person wants to follow through. Another to levitate. Talk about fail at goal-setting. Alas, there is hope yet. SMART goals to the rescue. Though by no means is the only strategy, SMART goals do provide a simple method for turning half-assedness into successful goal-setting and goal-achieving. And lest I be a pot among kettles, I shall first confess that I have not always been (OK, OK…make that never been) diligent about using the SMART methodology myself. But I do want to be more better at this whole goal thing-a-ma-jig and I’m going to start by making each one of my 43 Things SMART. I’m a Borders Rewards member, so I periodically get really good coupons from them, like 40% of any one book purchased March 31st-April 1st. Yup, two days, that’s all I get. One of my 43 things (if I was (or ever do get) on 43 things) is to build a personal library. So even though I have plenty of books I haven’t read, I am going to use the coupon to buy a new book, only I thought it would be interesting to let my Twitter friends weigh in on the purchase decision. This is what they said (accompanied by short descriptions/reviews, interesting and/or relevant links, and recommender comments…all included for your benefit should you happen to be looking for a new book with which to whittle away your non-existent free time). “Fast food is so ubiquitous that it now seems as American, and harmless, as apple pie. It is industry of consolidation, homogenization, and speed has radically transformed America’s health, landscape, culture, economy, and workforce, often in insidiously destructive ways. Eric Schlosser’s exposé addresses the vertical chain from in-store experience to meatpacking. Believe it or not, I think that you can actually read this whole book online via Google. An autobiography composed entirely of anecdotes recounting adventures in trading ideas on both physics and gambling, painting nudes, and accompanying a ballet on bong drums. One reviewer calls Nobel Prize-winning physicist Richard P. Feynman selection of commentary fiercely independent, intolerant of stupidity, and unafraid to offend while also revealing of the sources and expressions of authentic knowledge. Kinda makes me think of Twitter. Gladwell’s theory of social dynamics likens mass behavioral change to epidemics triggered by minor alterations in the environment or a small number of people who act as connectors, mavens, and salesmen. The Tipping Point reminds me of Just 1%: The Power of Microtrends, a manifesto by Mark Penn and E. Kinney Zalesne published on ChangeThis.com. Psarouthakis focuses on a incremental approach to success. “It is human desire to get better” and possible for both companies and individuals to grow in very positive ways by defining what it means to be “best” and focusing on continual improvement. A book about ‘lifestyle design’, or more simply, balancing work and play. There are plenty of books on this subject, and perhaps many address the same principles, but The 4 Hour Workweek centers on leveraging modern technologies for a full-spectrum of business activity, financial management, and communications. It has been called a manifesto for the mobile lifestyle. * @shalerjump hasn’t actually read The 4 Hour Workweek, but finds the discussion points interesting. @chuckreynolds seconded the recommendation, that is if you consider purchase and intent to read equivalent to a recommendation. The focus here seems to be less on the “crude, desperate glad-handing usually associated with the word ‘networking’” and more about the building of mutually-beneficial relationships. Among the key principles: never keep score, ‘ping’ constantly, remember names and birthdays, don’t fear vulnerability, look for mentors and become one yourself, and of course, never eat alone. This concept is actually one of the root ideas behind Noonhat.com, a tool developed by Brian Dorsey for connecting with new people outside of our normal social, work, and hobby circles over lunch. * @shalerjump hasn’t actually read this one either, but it is one of his mottos. gs bestowed by a woman named Anastasia on subjects as diverse as gardening, child-rearing, healing, Nature, sexuality, religion and more.